“Do you want to go kayaking on Saturday,” I asked. Okay, so I may be a little bossy. . . . But I have good intentions (and we all know where that takes you . . .). Late last summer I discovered that LIC Boathouse offered free kayaking! And not just short 20 min introductions to kayaking in a protected area, but trips too. I was really excited because I love kayaking. This past Saturday Ben and I signed up for the trip to Randall’s Island from Long Island City. We arrived at 8 am and signed waivers. The launch area is right next to the LIC Flea. It took about an hour to get everyone onto their kayaks. It was a fairly large group (around two dozen people plus the volunteers). Around 9 am, there was a short orientation and then we were off. LIC Boathouse times the trips so kayakers can take advantage of the currents. We got a favorable current going in both directions. I didn’t know before this that the direction of the current changed for the East River depending upon the time of day. 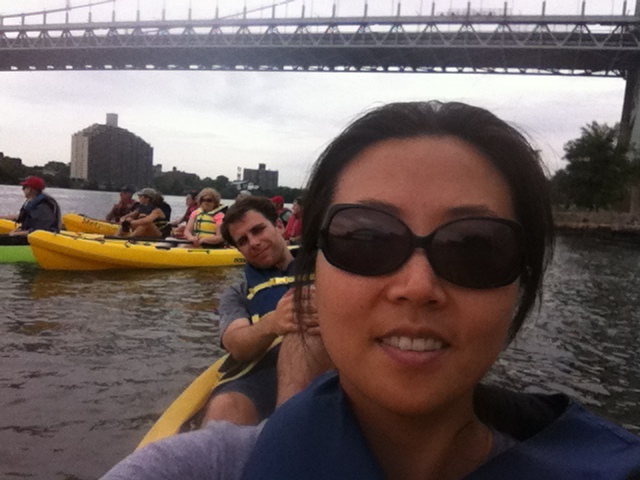 We kayaked on the East River from LIC, past Roosevelt Island and up to Randall’s Island. Randall’s Island happened to be hosting a swim/run event that same time. While we wouldn’t see the swimmers (the police wouldn’t let us kayak anywhere close to the buoys in case they needed to rescue tired swimmers), we were able to see the duathletes run. We pulled up close to the island and cheered loudly for the duathletes. They were very happy and excited to have spectators from the water. Then we paddled around Randall’s Island for a bit before heading back to LIC. On our way back, we passed Roosevelt Island on the west side, so we got to see both sides. We arrived around 11:15/11:30. The total time kayaking was under 2.5 hours, but the total time for the event from start to finish was about 4 hours. We had a lot of fun kayaking, but towards the end we were both tired and glad to be done. Kayaking is hard work. Afterward, we had some ice cream from Ice & Vice (how could we not?). Then we met up with one of Ben’s colleagues from work and hung out with him and his girlfriend for a short period. When we came home, we were exhausted and napped all afternoon. It was a good Saturday. If you live in New York City, there are several organizations that offer free kayaking all over the city and the outer boroughs. If you’re visiting NYC, you should check out free kayaking because it offers you a novel perspective from which to see NYC. Wow! That does sound amazing!!!! (at least it does up until you got stranded – but hey, you got a cool story out of it). Kayaking and then ice-cream! How awesome is that?! I would’ve never known you could kayak in New York. Very cool. Yes, there are all sorts of fun cool things like that in NY that you can do that people don’t think about. That sounds like fun! But I imagine kayaking the East River is tough. I live nearby and sometimes the current is crazy and super swirly when it’s changing. I’ve seen boats have problems. The kayaking was really fun, but yeah, it got tough toward the end. We both just wanted to get to shore and rest our poor arms. Thankfully we paddled with the current in both directions. I doubt we would have gotten far if we had to paddle against. I really stink at kayaking, but it’s still fun and this is such a cool/different thing to go do! (Good thing Ben listened to you!) I would probably be a hot mess trying to kayak in the East River! Kayaking in NYC is such an unexpected thing to do. It was fun and if I have time, I’d love to do another trip before summer is over.